You can’t read models, but you do talk to entrepreneurs in Racine and Yakima. Higher deficits will make them more insecure and more risk-averse, not less. They’re afraid of a fiscal crisis. They’re afraid of future tax increases. They don’t believe government-stimulated growth is real and lasting. Maybe they are wrong to feel this way, but they do. And they are the ones who invest and hire, not the theorists. In the figure below, I show two series. 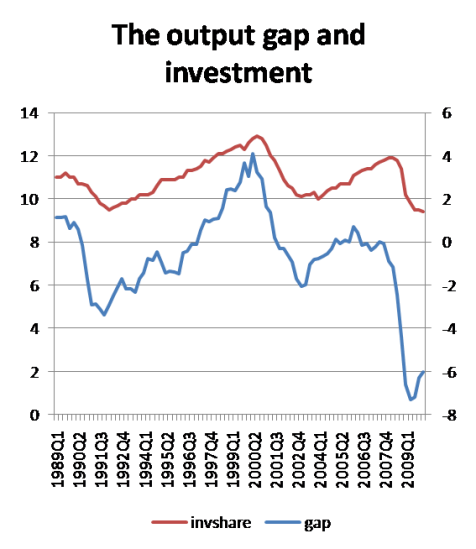 The red line (left scale) is nonresidential fixed investment spending – basically, business investment — as a percentage of GDP, from the BEA. The blue line (right scale) is the output gap — the percentage difference between real GDP and the CBO’s estimate of potential real GDP. What we see, first of all, is that business investment fluctuates with the state of the economy (duh). It’s actually a surprisingly tight relationship. Second, we see that investment has, if anything, fallen LESS than you might have expected given the plunge in the economy. We’re much further from potential output than in 2002, yet the share of investment in GDP is only slightly lower. Investment is lower because there's not enough consumer demand. That's the whole story.